Well, except for a few aircraft! 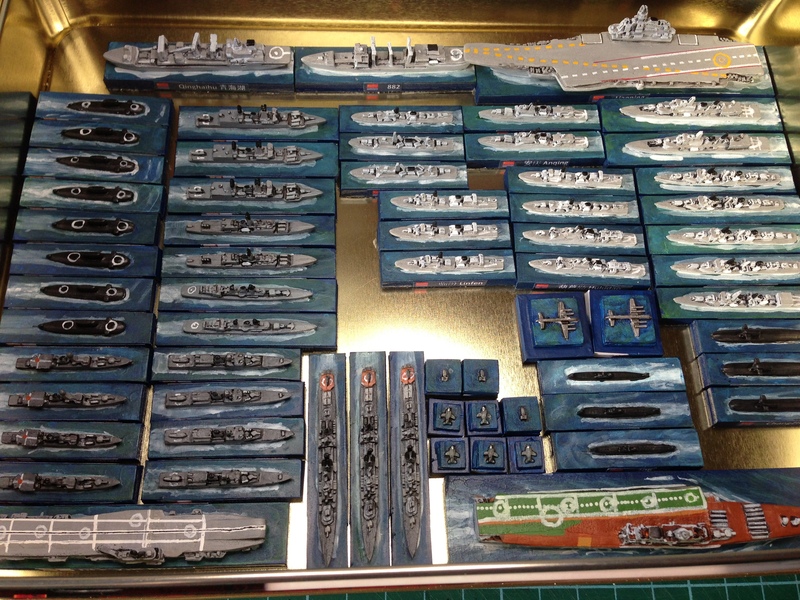 There, to the left, gentle reader, is the PLAN set ready to take on the Indian fleet. I am tempted now to consider some Japanese, maybe a European fleet of some sort or perhaps a ragtag South-East Asian fleet defending their combined oil interests from the Chinese. I am a little annoyed however as this time I had some problems with the varnishing. 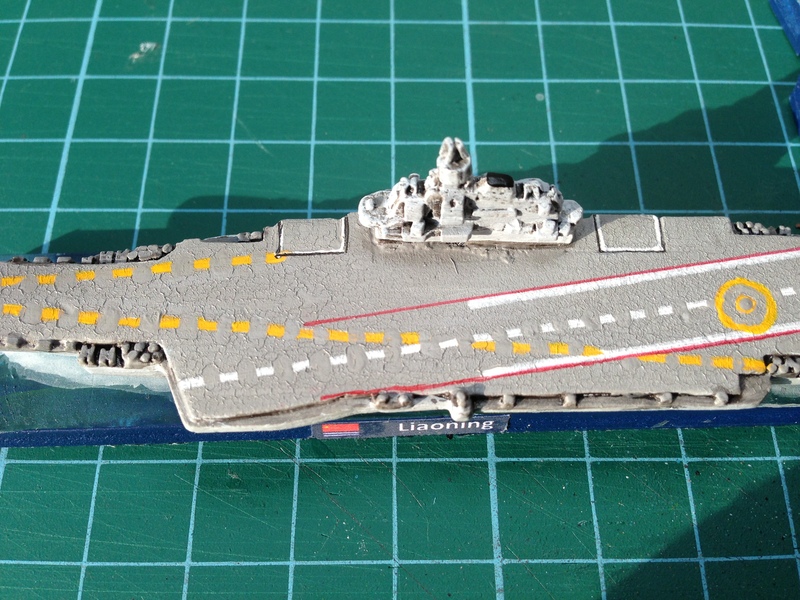 I am using the same Acrylic varnish that I have used for the last two years without any problem however this time it seems to have crazed some of the paintwork – in particular, the flight deck of the Liaoning. I am not sure whether the varnish is the issue or whether it is because I did not use Games Workshop’s Citadel painting on this one – but rather Army Painter colours. I will need to go back and have a chat perhaps to the nice folks at Paradigm Infinitum here in Midpoint, Singapore to see whether anyone else has reported a similar problem. I will do some testing of various paints on a flat surface in the next few days, when I get a chance, and report back. In the meantime, the two fleets are now safely accommodated in their semi-permanent home – a Scottish shortbread tin. 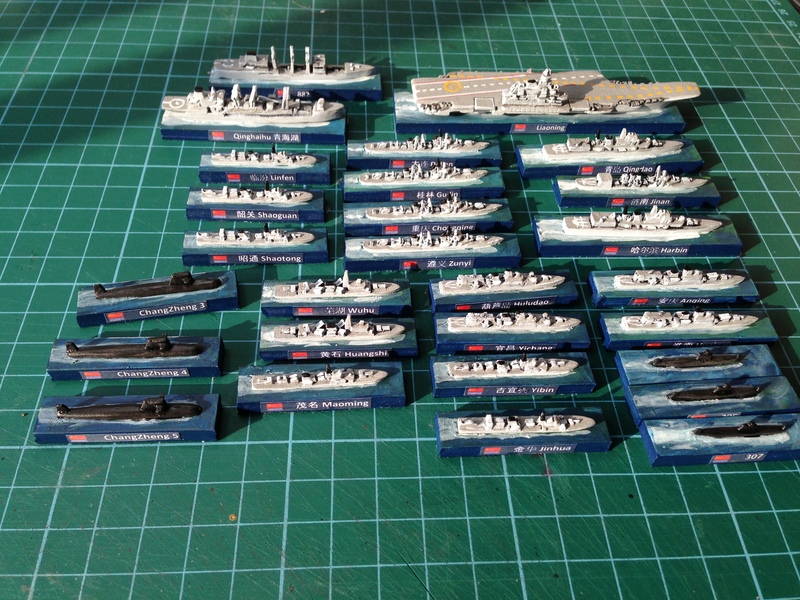 The Indian Navy on the left and the Chinese Navy on the right … ready for red force/blue force naval exercises! And yes, that is a spare Russian carrier at the bottom – maybe I should build a fleet around it! Oh you evil person … I was deliberately trying not to think about the Russians! Hmm … Russians … nooooo!